Last March NBC Universal and News Corporation announced a joint venture that we initially thought would result in a direct competitor to YouTube. As details emerged, it became clear that the two media conglomerates were not planning a video sharing website for user generated content but rather an online distribution channel for premium video content, including TV shows, movies, and short clips. 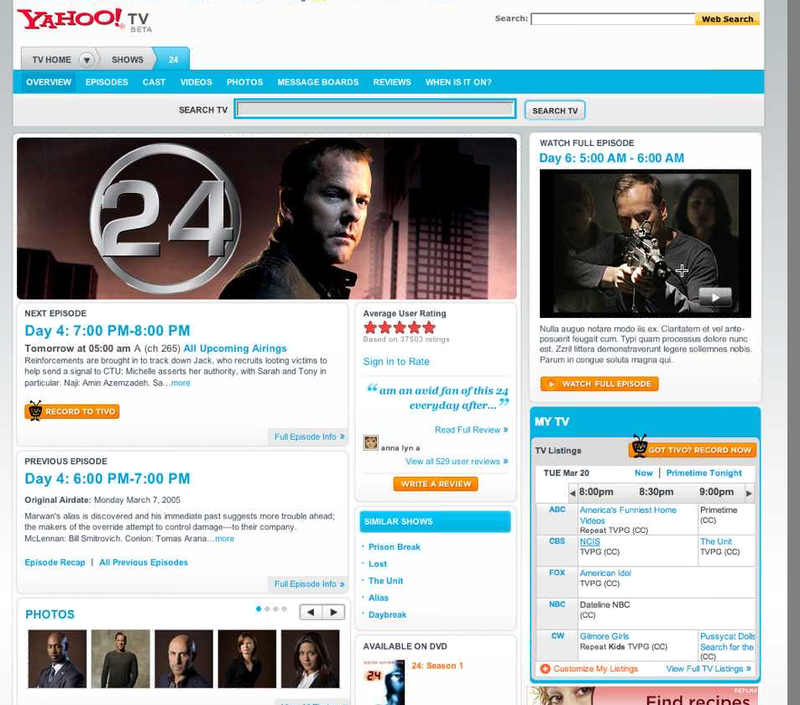 In the months following the companies’ initial press release, we gave the joint venture a lot of grief for failing to pick a name for the project, eventually settling on a name – Hulu – that meant “cease” and “desist” in Swahili, copying Google’s mission statement, and receiving not the greatest vote of confidence from NBC Universal’s own chief digital officer. Behind all of this criticism was a high degree of doubt that NBC and News Corp. were ever going to get Hulu out the door before the joint venture became irrelevant. In September, NBC had even announced a video downloading service that appeared to cannibalize its own joint venture with News Corp. However, this past week Hulu confirmed that it would indeed hit its self-imposed October deadline by launching in private beta on Monday, October 29th. And this past Friday, CEO Jason Kilar and other Hulu representatives demonstrated the new service to us. 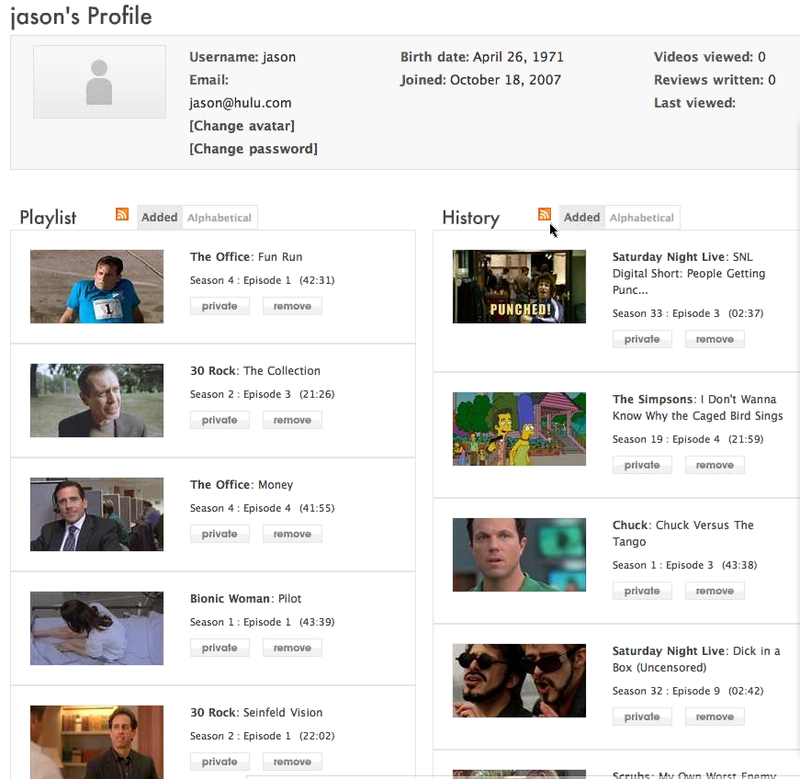 While we have not been able to try out the private beta ourselves yet, I was very impressed by the preview of Hulu’s interface and the bulk of its features. Before going into my thoughts about the website, however, I should get some of the many details about Hulu on the table, especially since it’s been months since the original announcement. Hulu is still a joint venture exclusively between NBC Universal and News Corporation. 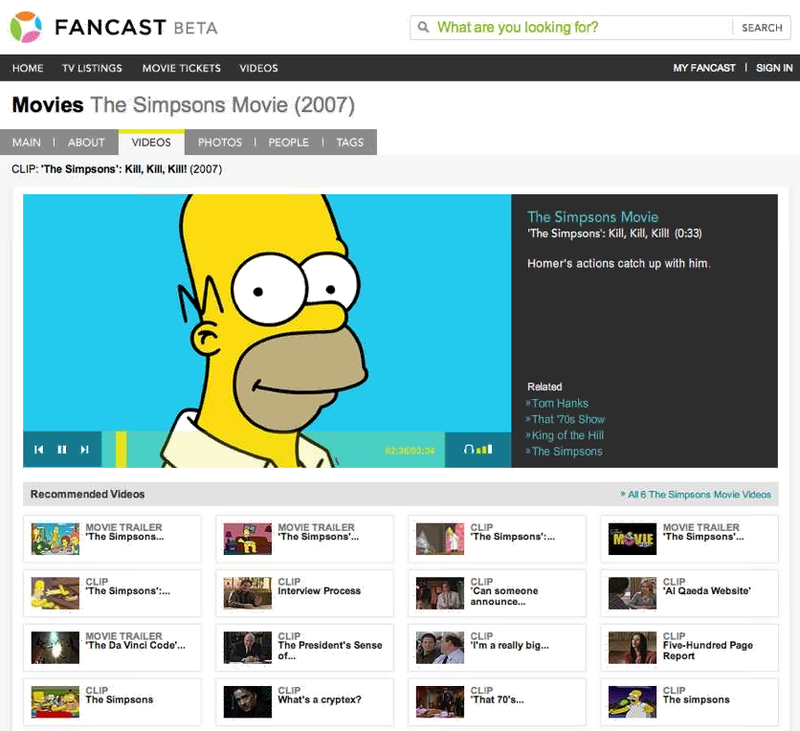 It exists as a website through which users can stream a collection of TV shows, movies, and short clips on-demand for free without any limits on how many times you can view each video. 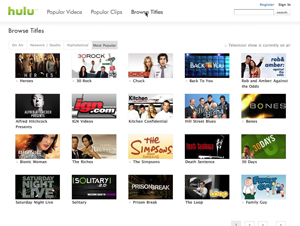 Hulu also exists as a distribution network of premium content for several partner websites – AOL, MSN, MySpace, Comcast, and Yahoo – that will display Hulu’s videos for free but in their own branded players. In addition to these partnerships, users themselves form a viral distribution network of sorts since Hulu allows its videos to be embedded in any website and shared via email. 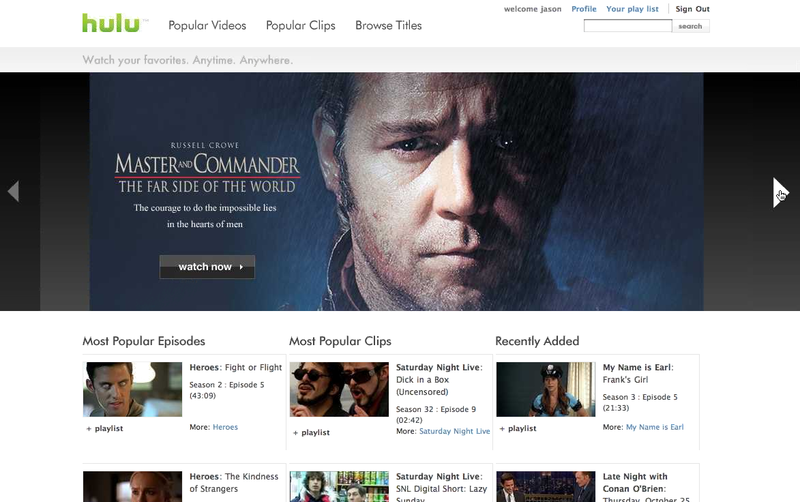 Hulu makes money in all cases from advertising, which it displays in and around the videos it serves. I’ll go more into the details of embedding and advertising later on. A couple of things that Hulu is not: a repository of user generated content like YouTube or a download service like iTunes Store. All of the video on Hulu is premium content and users don’t have access to any uploading capabilities. 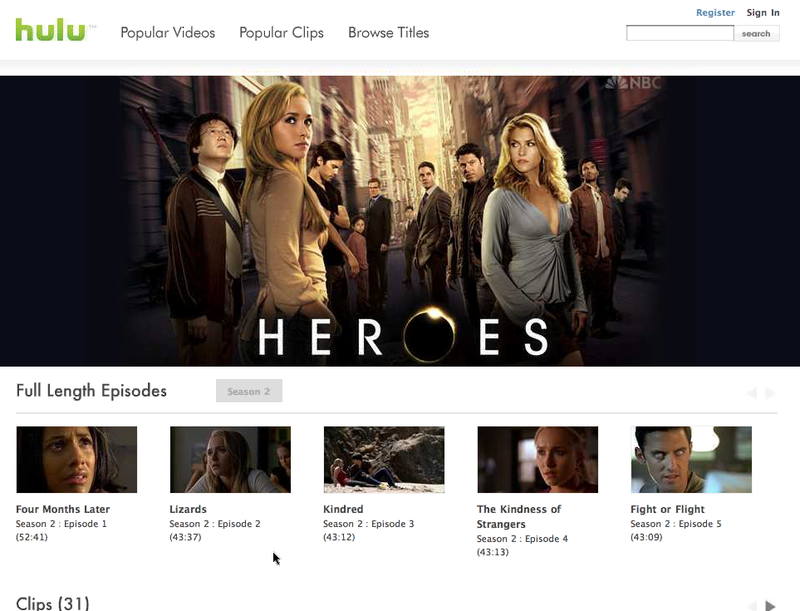 TV shows and movies can only be streamed through Hulu or one of its partners’ Flash players, not downloaded to your desktop or portable media player. While it’s understandable that NBC and News Corp. want to focus exclusively on premium content, it’s a shame that we can’t (yet) download videos from Hulu (either in an ad-supported format or for a fee). Perhaps this is something to look for in the future, although company representatives were mum on whether they had plans for it. As for the content on Hulu, TV shows will come from Fox and NBC, and over fifteen cable channels including Bravo, E!, FX, SciFi, Sundance, and USA. Movies will come from Fox and Universal, and following a deal signed just this Friday, from Sony and MGM as well. Hulu says many of its short clips will come from independent content providers, and it’s also signing licensing deals with others such as Smithsonian and the WWE. Overall, Hulu’s collection is impressive and we can anticipate seeing it grow even more in the coming months. Representatives say that they will listen to consumer demand to determine which shows and movies to add next. 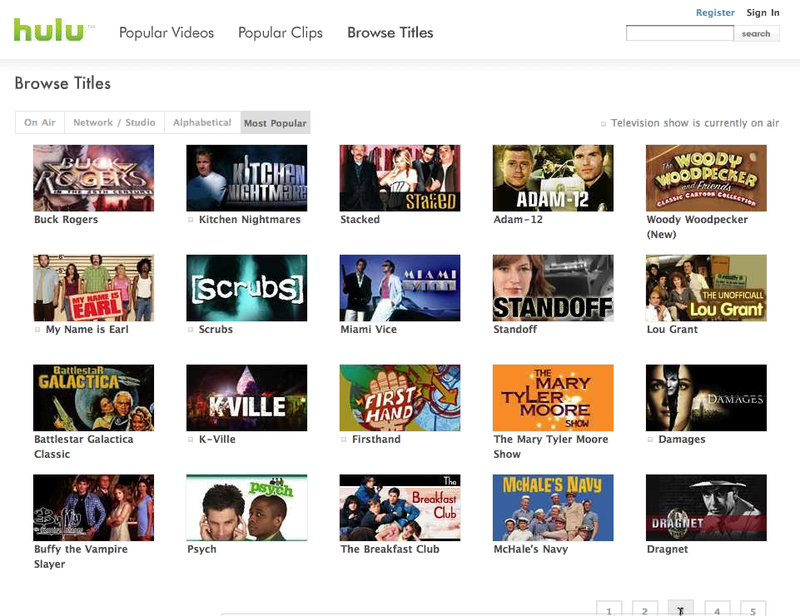 Click here to view a full list of the videos currently in Hulu’s collection. In terms of availability, Hulu as a website will not be available to the public for another few months. Its collection, however, will be rolled out on its partners’ websites over this coming week so we can expect to see most, if not all, of Hulu’s content on AOL, MSN, MySpace, Comcast, and Yahoo very soon. Just when particular videos will be available through Hulu – and how long we can expect them to stay on Hulu – will vary from video to video. However, as a general rule TV shows will be available on Hulu by midnight Hawaii time after they debut on normal television. As another general rule, Hulu will keep distributing TV shows until five weeks of newer episodes have passed, at which point older shows will presumably just disappear from the site. 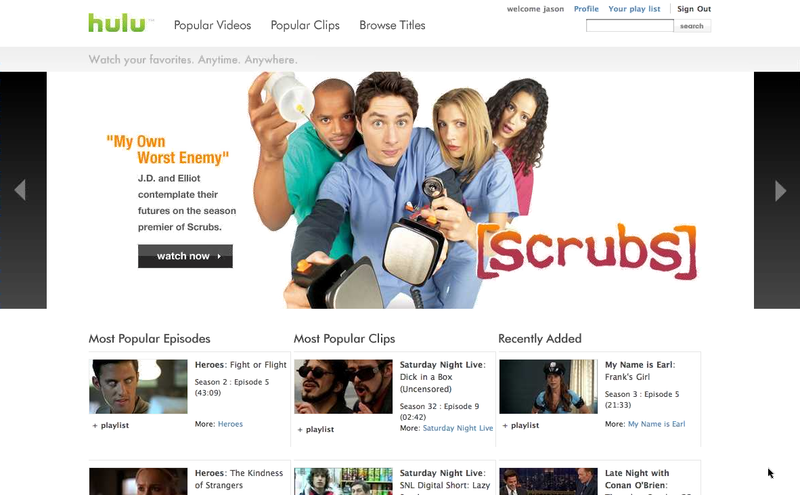 This is Hulu’s greatest weakness. Try as it might, it has not yet escaped the programming mentality of broadcast television. Hulu still imposes a schedule of sorts on Web viewers, even if that schedule comes with a five-week window of flexibility. But on the Web, five weeks may not be enough. Appointment TV just doesn’t make sense in a medium where time slots are thrown out the window and the available inventory of videos is counted in the millions. Hulu may be limiting its appeal by not keeping all of its videos up indefinitely (who knows when a particular video clip could take off as the next viral hit?). It also will be interesting to see how this limit affects embedded TV shows, which may just stop functioning after too much time. Similarly, movies and short clips will be added and removed from the site in an undisclosed (or uncertain) manner, although Hulu reps say they will try to add movies that are in demand. Hulu will not only have new releases but older movies as well, and only ten movies will be available to start. 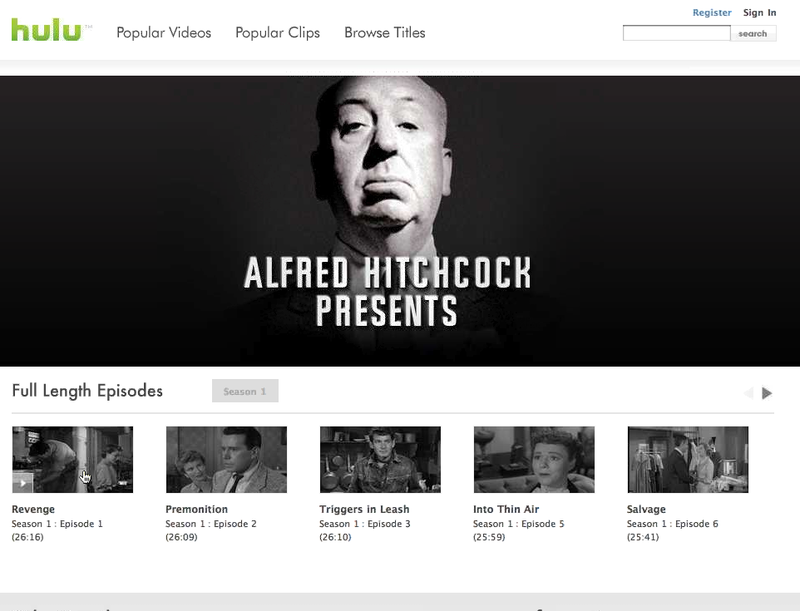 Now for the design and features of Hulu.com itself. First of all, the experience is entirely browser-based so there is no software to install beyond Flash player, which you probably already have. 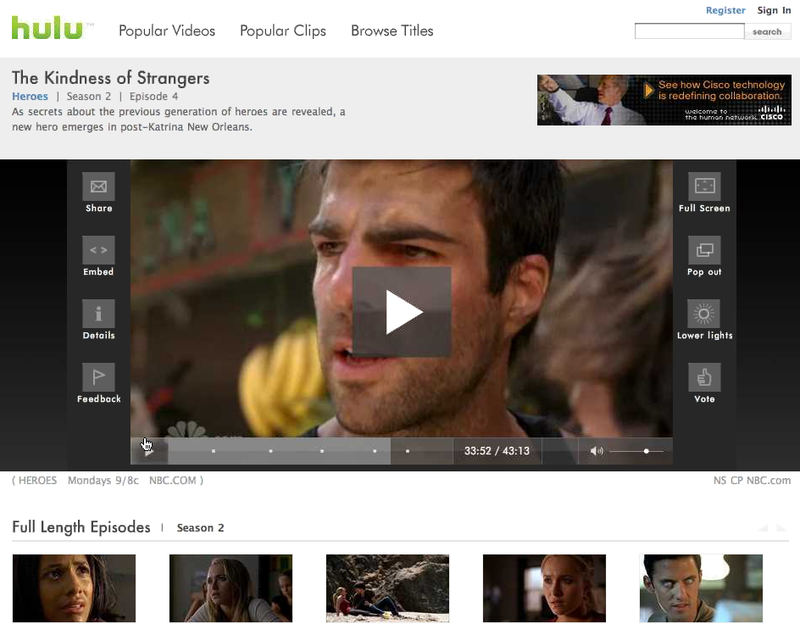 Hulu has done a good job keeping the user interface simple and highlighting the actual content of the site. 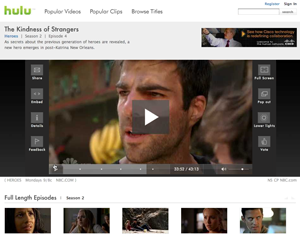 The homepage highlights a given video and lists the most popular episodes, the most popular clips, and recently added videos. 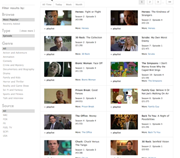 You can also search Hulu’s entire collection from the homepage. 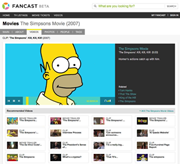 Other sections of the site list the available episodes for particular shows and let you browse videos by network/studio, alphabetical order, or popularity. 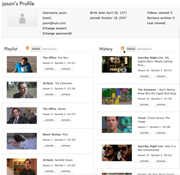 On your user profile page, you can create a video playlist and check your viewing history. 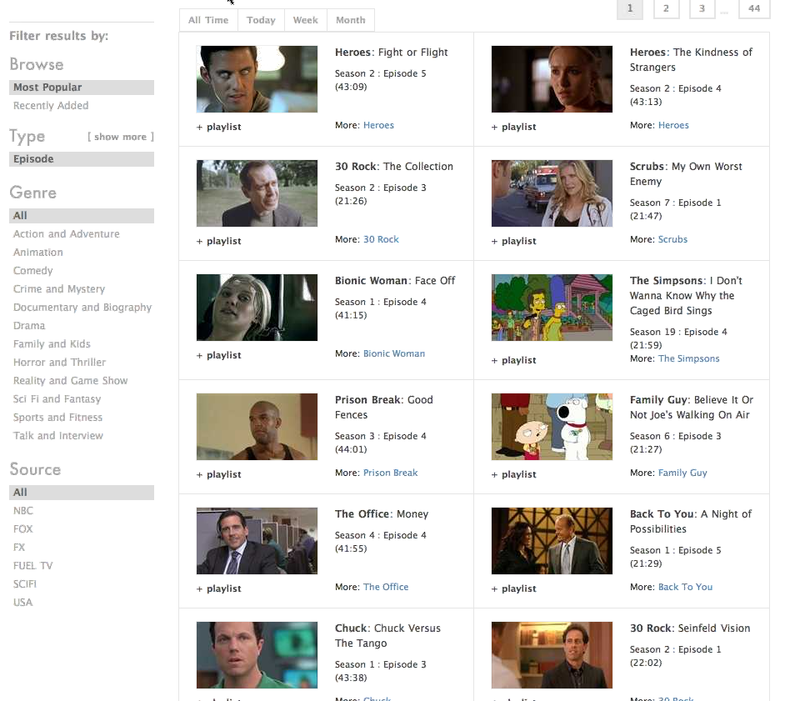 Both your viewing history and playlist can be shared via RSS which, in addition to user reviews that you can leave at the bottom of video pages, form pretty much the extent to which Hulu.com incorporates social features. The videos themselves are streamed at either 480kbps or 700kbps depending on your bandwidth, and Hulu is working with Adobe to provide even higher resolutions through Flash Player 9.2 by the end of the year. 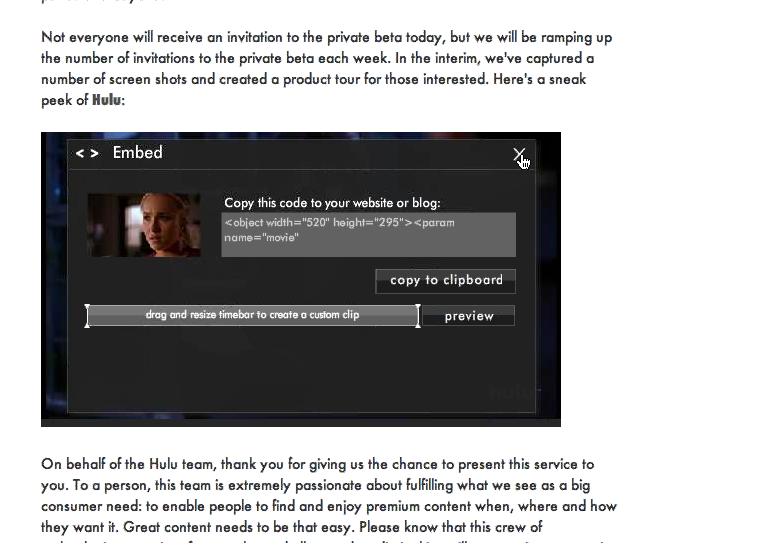 Hulu’s video player sports all the basic features we see in embeddable players these days: sharing via email, embedding via HTML, video details, full screen, seeking, and volume. It also has buttons with which users can submit feedback directly to Hulu, pop the video out into its own window, darken the rest of the page for better viewing, and vote the video up or down. Perhaps the coolest feature of the player is the ability to select just a segment of the video to share with friends or embed on your website. Embedded videos have fewer features, but users can still share and embed videos that have already been embedded, which should really help to spread Hulu’s videos virally (and make it less popular to embed low-quality versions hosted on YouTube). 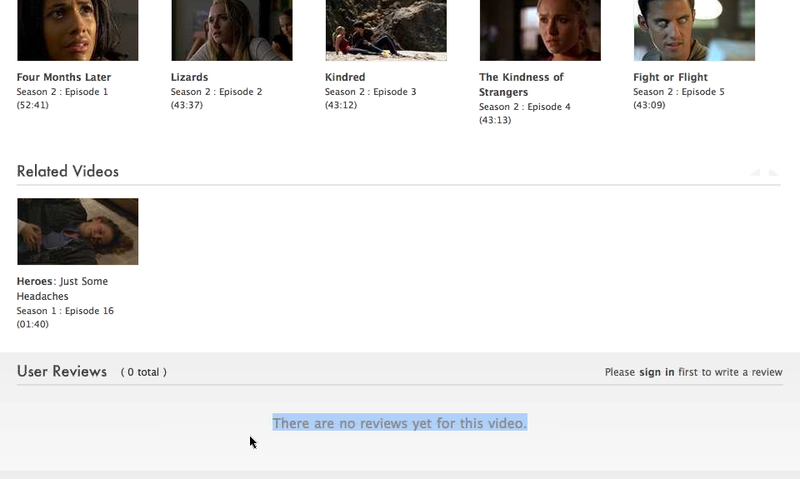 But, again, if the embedded video expires or is replaced with new content that the embedder did not choose, that could end up backfiring on Hulu. Finally, some important information about how Hulu plans to advertise. While we can’t be certain just how advertising affects the user experience without trying Hulu ourselves, Hulu reps say that advertising will be much less intrusive than on actual television. 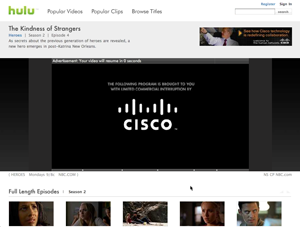 Ads will be served in a variety of ways: banners that display alongside videos, text blurbs that overlay the bottom of videos, and in-video clips that play before, within, and after videos. Shorter videos will tend to have overlays and banner ads, whereas longer videos will tend to play in-video commercials. Hulu says that for longer videos, the total playback time dedicated to advertisements will be drastically lowered, perhaps constituting only 25% of the time you’d spend watching ads on TV. Thus, for every 30 minutes of video, you may only see 2 minutes of ads, whereas on TV you would see 8 minutes. If this is true, then Hulu will certainly be more consumer-friendly than TV. However, that is still probably more commercials than people are used to when watching video on the Web.. We’ll just have to see how intrusive the ads actually are when we play some shows and movies ourselves. 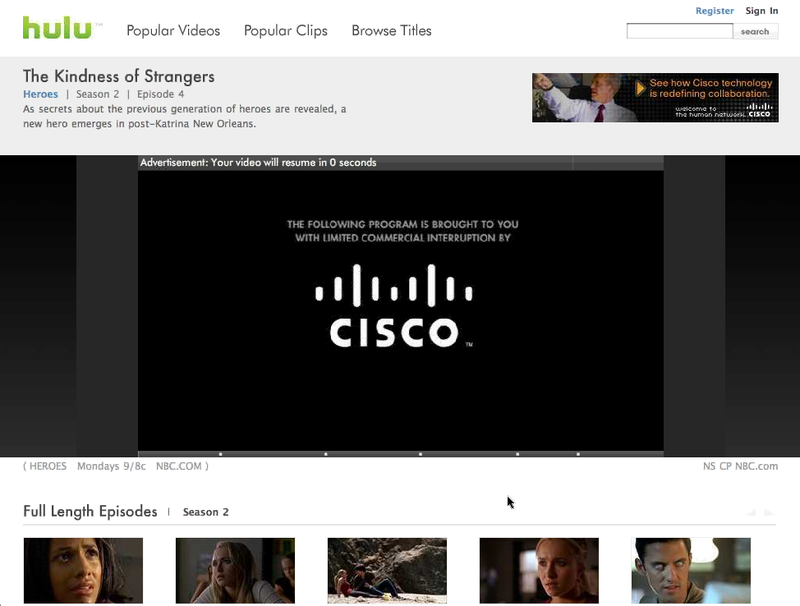 Advertisements will be shown in Hulu’s videos whether or not they are played at Hulu.com, and Hulu will power all of the advertising, splitting revenue with its partner sites. 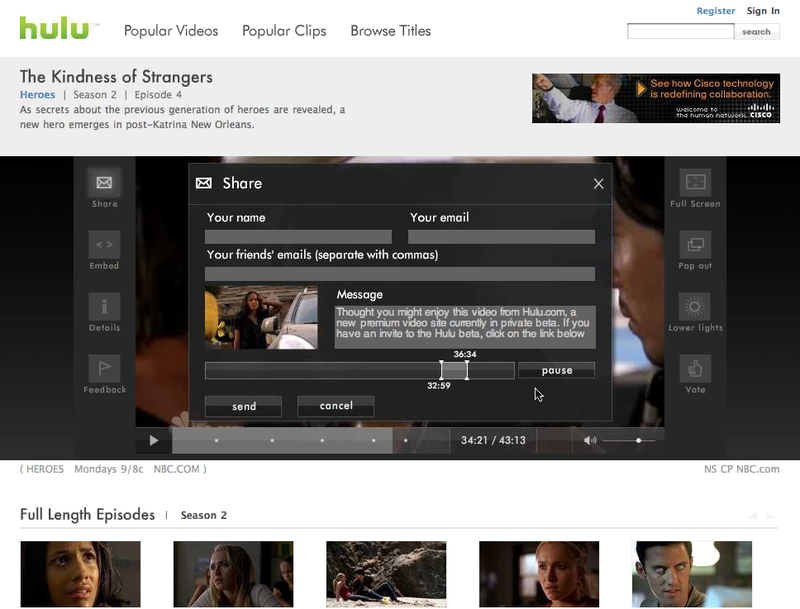 Below are some additional screenshots of Hulu. Keep in mind, we captured these from a Webex session so the rendering quality is relatively poor. 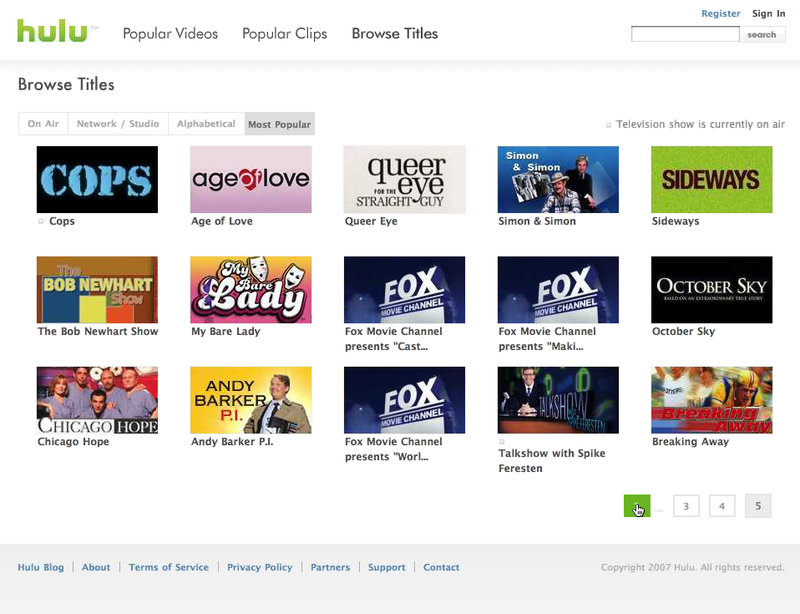 Update: Hulu videos are already available on at least one partner website, AOL. Check them out here If you live outside of the US, however, you may be out of luck. Duncan, who lives in Australia, sees this error message when he tries to view a Hulu video on AOL.